At least three people have been killed in clashes between supporters and opponents of ousted president Mohamed Morsi in Mansoura, in Egypt's Nile Delta, medical sources told AFP. "Three people were killed and seven others wounded by birdshot and stabbing attacks during clashes between Morsi supporters and his opponents," Adel Said, a hospital official in Mansoura, told the agency. The victims, all of whom are women, have all been identified. The death toll was also confirmed by another health official, who said that victims were shot. Ten more people have also been injured, one of whom was in critical condition. Activists on the ground, especially from the Muslim Brotherhood bloc, place a higher number on those killed, while some tweets from Egypt suggest that as many as 200 people were wounded, including a number of minors. Local activist Abdullah el-Nekeity told AP that clashes began after a mob attacked the pro-Morsi demonstrators with live ammunition, birdshot, knives and attack dogs. 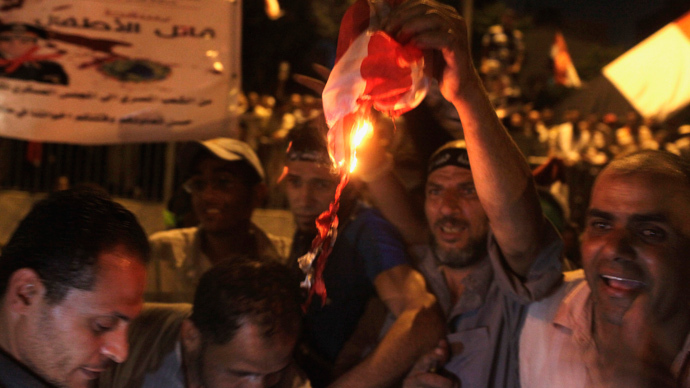 Some demonstrators fled until security forces arrived, el-Nekeity said. In a statement, the Muslim Brotherhood blamed hired thugs for the violence. 3 women & 1 17yr old girl murdered in #AntiCoup rally in #Mansoura. 200 wounded. Attacked w/ bladed weapons, pallet shotguns & live rounds. 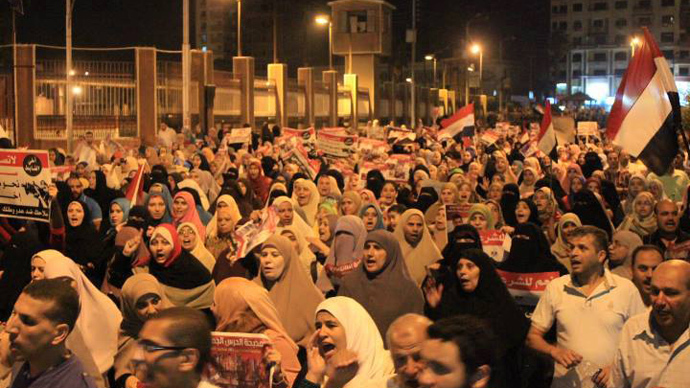 In addition to Mansoura, clashes between Morsi's supporters and opponents engulfed Egypt on late Friday night. Security forces intervened with tear gas to disperse the scuffles. Police forces in Qena, in Upper Egypt, fired tear gas to stop clashes in the city center after several rallies merged. 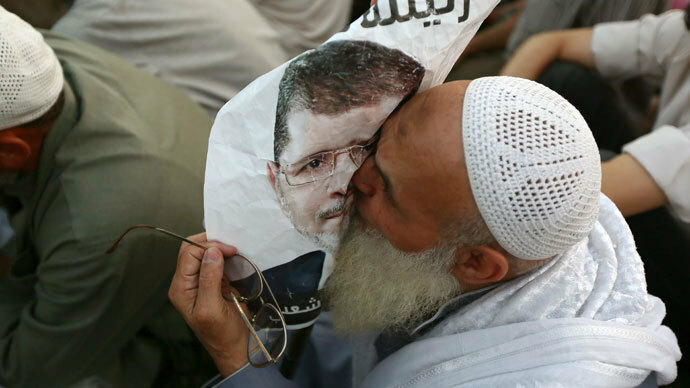 In the city of Ismailia, at the Suez Canal, many Muslim Brothehood supporters took to the streets calling for Morsi’s reinstatement and condemning what they call a “military coup” against the democratically elected leader. They chanted slogans against military commander-in-chief and Defense Minister Abdel Fattah El-Sisi. Other rallies were held across Damietta, the Nile Delta, Alexandria, Gharbiya, Sharqiya and Fayoum, and Beni Suef and Assiut in Upper Egypt, Ahram reports. In the capital Cairo, police also teargassed pro-Morsi demonstrators clashing with anti-Morsi factions as thousands of demonstrators marched towards the presidential palace. 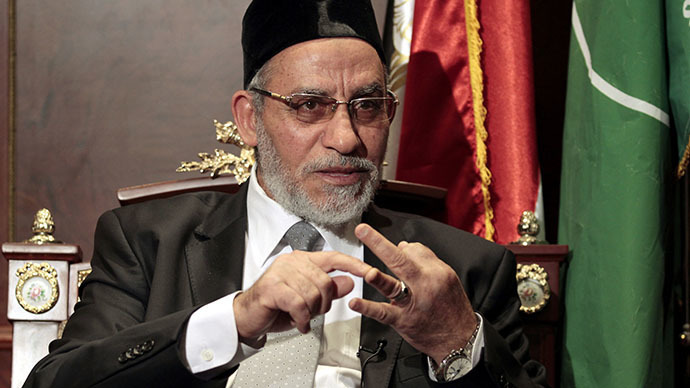 With the Muslim Brotherhood having such deep roots in Egyptian society, the only way to untie the political deadlock is to form a coalition government, believes award-winning journalist Hugh Miles. No matter how experienced and qualified the people in the new Egyptian government are, they will not manage to turn the country around unless there is genuine political reconciliation between the opposing factions, explained Miles.